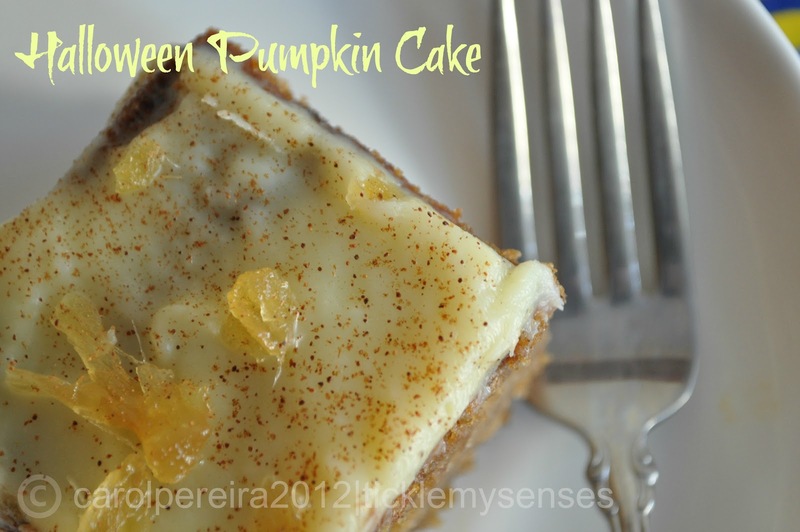 Tickle My Senses: Pumpkin Cake for Halloween. For some reason Baby A has gone off his greens!! (fortunately he still loves his fruit, touch wood!!). I've been on a mission to try and incorporate as many varieties of vegetables or fruit into his favourite post dinner treat. So far I've tried my hand at baking him cakes with Apples, Carrots, Pineapple and Banana, Dates, Avocado, Banana and Apricot. Though he has enjoyed most of them, his all time favourites still are the Egg Free Date and Walnut Cake and the Spicy and Moist Carrot, Raisin and Nut Cupcake. As for this week it was a very straight forward and simple pick.....in preparation for Halloween the supermarkets in the UK have been flooded with carving and cooking pumpkins, so Pumpkin Cake it is. 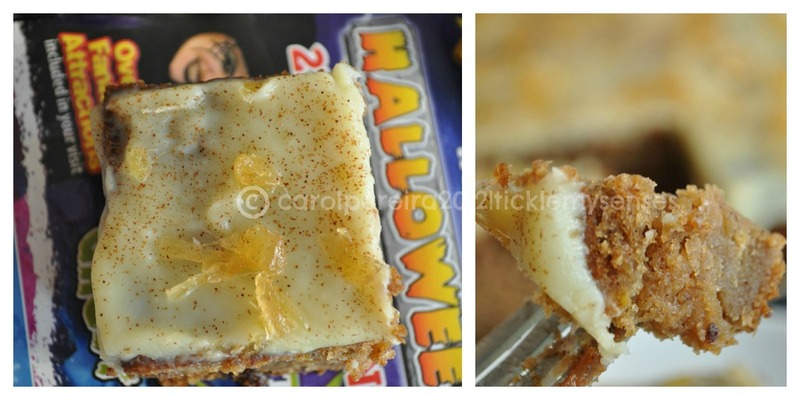 I found this much liked and highly rated recipe for a pumpkin cake here and adapted it largely to suit me. 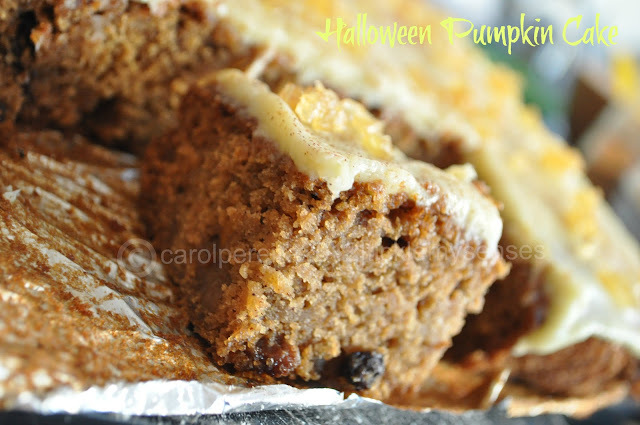 The grated pumpkin gives this cake a moist crumb, the plump raisins adds to the yumminess, and the ground cinnamon, cloves and ginger adds a delicate flavour. Then comes the lovely creamy cheese topping that just makes the cake wonderfully luscious and addictive. The resultant cake is light, moist, delicately spiced and absolutely delicious. You will absolutely love it....trust me !!! Zest of orange : 1 no. 2. Butter and line a 30 x 20cm baking or small roasting tin with baking parchment. 3. Put the flour, sugar, spice, bicarbonate of soda, raisins and salt into a large bowl and stir to combine. 4. Beat the eggs into the melted butter, stir in the orange zest and juice, then mix with the dry ingredients till combined. Stir in the pumpkin ( after squeezing out extra moisture with hands). Pour the batter into the tin and bake for 30 mins, or until golden and springy to the touch. To make the frosting, beat together the cheese, butter, icing sugar, orange zest and 1 tsp of the juice till smooth and creamy, using a palette knife, spread over the top of the cake. To decorate sprinkle 2-3 tsps of grated ginger on top of the frosting and add a sprinkling of powdered cinnamon. Will keep, covered, for up to 3 days in the fridge. 1. Pumpkins can vary dramatically in water content, so keep an eye on the cake towards the end of cooking - yours may take less or more time to cook through.